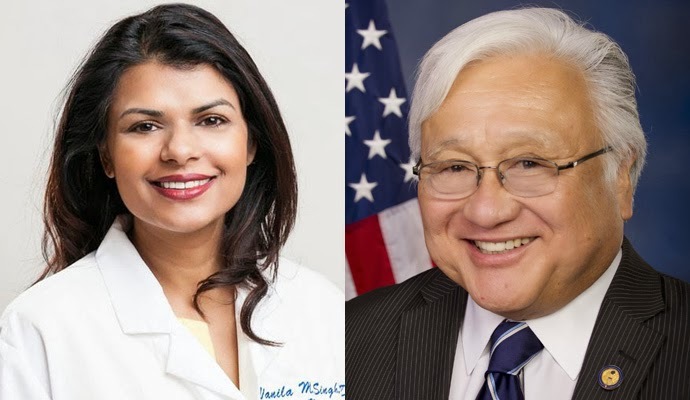 US Congressional election in Silicon Valley this year was being seen as a two-person race between incumbent Congressman Mike Honda (Democrat) and his main challenger Rohit "Ro" Khanna (Democrat) until recently. It all changed when Dr. Vanilla Mathur Singh (Republican), a member of Hindu American Foundation (HAF), entered the race in December 2013. The HAF first made headlines in 2005 with its failed attempt in California state to "improve 6th grade textbooks so that these books actually reflect their (Hindu) beliefs and their religious practices." Media reports indicate that Singh was recruited to run by Shalabh "Shalli" Kumar, a Chicago-based Indian-American businessman and Republican fundraiser. Kumar is the founder of a super PAC, Indian Americans for Freedom, with close ties to Hindu Nationalists. He has been lobbying members of US Congress to help rehabilitate his "idol" Narendra Modi of India's Hindu Nationalist Bharatya Janata Party (BJP). Modi has been denied US visa multiple times by the State Department because of his widely suspected role in the killing of thousands of Muslims in 2002 Gujarat riots. Singh told San Francisco Chronicle that she raised $100,000 in the five days after declaring her candidacy, including $25,000 of her own money. The rest, she said, came from about "20 family and friends." Kumar's super PAC could change the dynamics of the South Bay race if he chooses to back Singh financially. In 2002, his super PAC spent $500,000 in an unsuccessful attempt to defeat Rep. Tammy Duckworth, D-Ill., including producing an ad set to Middle Eastern music that showed the double amputee Iraq war veteran wearing a headscarf during a visit to a local Muslim community center. Ro Khanna, a Silicon Valley patent attorney of Indian origin, is backed by many of Silicon Valley’s top VCs and executives at Google, Facebook, Yahoo and other tech companies. Other Notables include Marc Andreessen, the Netscape co-founder; John Doerr, the venture capitalist; and Randi Zuckerberg, the chief executive of Zuckerberg Media and the sister of Mark Zuckerberg and Sean Parker, former President pf Facebook. Four months before the primary, Khanna has $1,975,000 in cash on hand, or more than triple the incumbent’s $623,000, according to campaign finance records filed last Friday as reported by the New York Times. Khanna supporters expect him to win to push legislation in Congress to liberalize US visas for foreign workers needed to fill Silicon Valley tech jobs. He supports raising the number of H1-B visas, keeping a lid on capital gains taxes and cracking down on patent trolls while charting a progressive agenda on most social issues. 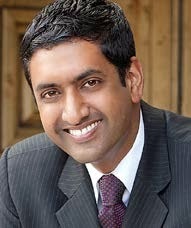 Faced with the surprise new challenge from the Hindu Right, Ro Khanna has refused to denounce Narendra Modi for fear of alienating a significant chunk of the substantial pro-BJP Indian-American voters in Silicon Valley. Mike Honda, the incumbent congressman from 17th district, is a Japanese-American who was put by the United States in an internment camp as a child during World War II. He has been a featured speaker at many Muslim-American events where he has spoken out for American Muslims' civil rights since the terrorist attacks of September 11, 2001. During a 2009 keynote speech at Human Development Foundation fund-raiser that I attended, Congressman Honda said the US foreign policy should have the same goals that the HDF has in Pakistan. Drawing from his experience as a US peace corps volunteer to support education and infrastructure development in Central America in the 1960s, he proposed a similar effort in restoring US credibility in Pakistan and Afghanistan. Honda praised the US emphasis on economic aid and said he supports the 80/20 rule that General Petraeus had outlined, with 80% emphasis on the political/economic effort backed by 20% military component to fight the Taliban insurgency. Honda says he has been a strong advocate for the tech industry in Congress. As a member of the House Appropriations Committee, he helped get millions of dollars in funding for BART extension to San Jose, a top priority for Valley leaders, as well as federal investment in nanotechnology research. His strong backing from organized labor and veteran Democrats reflects the decades he's spent in public service. Honda also supports an increase in H1-B visas, although he's also expressed concerns about its potential harm to the local labor pool. A number of polls in 17th district so far show that Honda enjoys a healthy lead over his challenger Khanna. Honda's lead could increase if Singh takes a significant chunk of Indian-American votes away from Khanna. In spite of a powerful tech industry funded challenge by Ro Khanna, Honda remains a favorite to win. Honda also enjoys the strong endorsement of President Obama and Democratic Party's establishment. Singh's entry in the race could further help Honda extend his lead and keep his seat in Congress. I intend to vote for Mike Honda based on the Congressman's strong record of service to Silicon Valley and his unambiguous pro-civil rights stance. No surprise here. A noteworthy element is Khanna's refusal to negativley comment on Modi. The Pakistani community, surprising as it may seem, is too fragmented, and too likely to oppose, if not to actually attack any (potential, if not actua) public-office candidate, even if one materializes, on the grounds of his/her religiousness. I know of no non-professional organization organization that does NOT have the word Islam in it. We are doomed to a fourth-world status if we continue to have a medieval ouitlook on life, and do not pull ourselves out of an nonn-inclusive "islamic" bent of mind. Several years ago, the Tata Motor Company was allowed to establish a plant to build the “world's cheapest car” in Gujarat with surprising ease, flouting every rule in the book and even the state's industrial policy. The Hindu Saffron Brigade demands for itself abroad what it denies to the minorities at home. A sting operation by news and current affairs channel News Express claims to have exposed malpractices of 11 opinion poll agencies. The channel claimed these pollsters were willing to manipulate data and provide “misleading results”. Following the exposé, the India Today group suspended the services of an agency implicated in the operation. The sting, titled Operation Prime Minister, does not offer any evidence to show that any media-commissioned survey in the past year has been deliberately manipulated. The aim, according to the channel, is to “expose mindset and intent”. Transcripts provided by the channel reveal that when approached as lobbyists on behalf of political parties, heads of such agencies were willing to provide two sets of data — original and manipulated — for different rates. Also on offer were increasing the margin of error to show a spike in seats; showing contradictory results projecting rival parties as leading the electoral race by creating separate companies; deleting negative data; and manipulating data to any extent at the behest of the client. At a press meet on Tuesday, News Express editor-in-chief Vinod Kapri said the sting was motivated by the Election Commission’s letter to parties inviting their views on opinion polls and the mushrooming of such polls. In one instance, pollster Yashwant Deshmukh of CVoter, told the channel’s undercover reporter that while 3% was the standard margin of error, “at best, we can put it to 5%”. Following the sting, India Today said they were suspending the services of CVoter. Representatives of Quality Research and Services allegedly told undercover reporters they first did a survey projecting the Bharatiya Janata Party (BJP) as winning 200 seats in the Uttar Pradesh assembly elections and then created a fictitious company to project the Samajwadi Party (SP) getting as many seats. Mittal, however, added these agencies had said they could get the surveys broadcast on channels. Following the sting, Aam Aadmi Party leader Arvind Kejriwal tweeted that the “truth and fraud” of opinion polls had been exposed and it was “shocking”. The Pew Research Center poll said the Indian public, by a margin of more than three-to-one, would prefer BJP to lead the next government over Congress. It said 63 percent of Indians prefer the BJP to lead the next government, 19 percent prefer Congress and 12 percent support other parties. BJP backing is consistent across age groups, the research found. Pew, a Washington-based think tank, interviewed 2,464 randomly selected adults in states and territories that are home to roughly 91 percent of the Indian population. The poll, conducted between Dec. 7 and Jan. 12, has a margin of error of 3.8 percent. Modi, the chief minister of western Gujarat state for the past 11 years, is credited with turning his state into an industrial haven. But critics question whether the Hindu nationalist chief can be a truly secular leader over India’s many cultures. Rahul Gandhi, heir to the country’s Nehru-Gandhi political dynasty, is leading the Congress party’s struggling campaign. Congress has said it will not formally declare Gandhi as its candidate for prime minister — a bit of political maneuvering aimed at protecting the 43-year-old from being a scapegoat for his party’s problems. The Congress party has been battered by corruption scandals, internal feuding and an inability to deal with a stumbling economy and deep-rooted problems with poverty, infrastructure and education. Modi also is facing his share of controversy. He has been accused of doing little to stop anti-Muslim riots in the state in 2002 which left more than 1,000 people dead, mostly Muslims. Modi is where he is today – on the cusp of power — not because the country is becoming more communal but because the Indian corporate sector is becoming more impatient. Every opinion poll that shows him inching towards power sets off a bull run on the Bombay Stock Exchange. In a recent dispatch for the Financial Times, James Crabtree noted the exceptional gains notched up by Adani Enterprises – the company’s share price has shot up by more than 45 per cent over the past month compared to the 7 per cent rise registered by the Sensex. One reason, an equities analyst told the FT, is that investors expect a government headed by Modi to allow Adani to expand his crucial Mundra port despite the environmental complications involved. “So the market is saying that, beyond the simple proximity of Mr Adani and Mr Modi, these clearances may no longer be so hard to get under a BJP regime,” the analyst is quoted as saying. The U.S. Congress doesn't usually weigh in on domestic politics in other countries, but a resolution recently introduced in Congress by Rep. Keith Ellison is designed to put pressure on Narendra Modi, the front-runner to be India's next prime minister. The resolution suggests that the State Department should continue to deny him a U.S. visa. Many hold Modi responsible for one of the worst episodes of religious violence in India's recent history — riots in the state of Gujarat in 2002, which left more than a thousand Muslims dead. When I first began covering the Congressional race between Mike Honda and Ro Khanna, the drama was fairly straightforward: A popular old school Democratic incumbent being challenged from within his own party by a young upstart with the backing of the richest and most powerful plutocrats in Silicon Valley. The two candidates were battling for some of the most fertile soil in Silicon Valley: A congressional district that’s home to tech megacorps like Apple, eBay, Intel, Yahoo, and AMD. And the press was heralding it as a clash of political cultures: the first time that Silicon Valley was fronting its own candidate to take on the Bay Area’s powerful liberal Democratic Party machine. Ro promised his mega-wealthy donors that he’d use Silicon Valley culture to disrupt national politics and make the world a better place — it would be Washington D.C. 2.0. But as the June 3 primary approached, and the fight for the heart of Silicon Valley devolved into a messy five-way free-for-all, it became clear that Khanna couldn’t so easily disentangle himself from real world politics. His vision of a technocratic political utopia met reality, and reality won. He got bogged down by uninspiring politics and accusations of a dirty tricks campaign to manipulate the vote in his favor. It got sucked into something else as well: a bloody and violent political and religious conflict imported from more than 8,000 miles away. A conflict whose major player has just been elected prime minister of the largest democracy in the world and who, bizarrely, might also have the power to change the course of a local California election that’s financed by some of technology’s biggest billionaires. That was how GOP Congressional candidate Vanila Singh reacted to allegations and evidence that the Ro Khanna campaign recruited dummy candidates to split his opponents’ vote. There was something very funny about Singh getting upset about Khanna running dummy candidates — considering that she herself was initially recruited to spoil Ro Khanna’s campaign. Singh does not like to talk about that anymore — and her campaign now cuts off access to any journalist who dares to ask — but Singh was quite candid about it just after she officially entered the race earlier this year, telling a local paper that she had decided to run for Congress at the prodding of Shalabh Kumar — a rightwing Chicago businessman who had it in for Ro Khanna. The bizarre motive? It all had to do with a rightwing Hindu supremacist politician named Narendra Modi. If that name sounds familiar, it’s because last week Modi was elected as India’s prime minister when he and his ultranationalist Bharatiya Janata Party won a landslide victory. But back when Vanila Singh entered into the race, Modi was still just the Chief Minister of the Indian state of Gujarat. He was also persona non grata in the United States. Since 2005, Modi had been on the State Department’s “visa blacklist” for his role in a 2002 bloody and nightmarish anti-Muslim pogrom that left several thousand dead and many more injured and displaced in Gujarat under his watch. The violence was truly horrific and lasted for weeks. Women, men, children and the elderly were lynched — shot, hacked apart, beaten to death and burned alive. Women were raped; those who were pregnant had their stomachs slit open, fetuses ripped out and burned. Businesses and homes were looted and set on fire. An estimated quarter million people — mostly impoverished Muslims — were driven from their homes and ghettoized. In more than five hours of testimony, Doerr retraced Pao’s trajectory through Kleiner Perkins, from a staffer who described herself as his “surrogate daughter,” to a disgruntled junior partner who felt she was repeatedly snubbed for promotions and choice assignments. With Pao’s mother watching from the front row, Doerr said he wanted Ajit Nazre, a Kleiner Perkins partner who engaged in a consensual affair with Pao in 2006 to be fired. The trial is taking place in San Francisco Superior Court. Doerr said he ultimately agreed that Nazre not be fired because other partners wanted to keep him and because Pao and Nazre said they could work together. Kleiner Perkins partners reduced Nazre’s bonus in 2007 as punishment for the affair. “But his biggest punishment was that I told him I’d lost confidence in his ability to be a leader of the firm, and he’d have to regain that confidence,” Doerr told Exelrod. The following year, Nazre was promoted to senior partner, even though Doerr said he had reservations about Nazre’s trustworthiness. “I don’t remember how I voted, but the partnership voted, and [Partner Emeritus] Ray Lane was a strong supporter,” Doerr said. Doerr hired Pao in 2005 as part of what Doerr called “Team JD,” which meant she helped him manage his time. Early on, he gave her advice on areas where the firm though she could improve. Pao tended to be dismissive and had conflicts with other partners, Doerr said, including with another female partner, Trae Vassallo. Nonetheless, he praised her work. “You have contributed extensively and I’m delighted that you chose to join KPCB,” her first review said. After a couple of years, Pao became less happy at the firm and talked to Doerr about leaving. She offered suggestions on ways that Kleiner Perkins could improve. “Honesty with partners,” was one suggestion, according to a document shown in court. “Quality in our work” was another. In June 2007, Pao told Doerr about the affair with Nazre. She also complained that a third partner, Randy Komisar, had given her a book of poetry on Valentine’s Day and asked her out to dinner when his wife was out of town. Doerr told Exelrod that it was common to give gifts at the firm and he didn’t ask why Pao would be upset about the book. In 2009, he still thought highly enough of her that he thought the firm should work hard to keep her when she got an offer from a rival firm, Google Ventures GOOGL -1.08%. She would be given “more carry, comparable income and be given more responsibility in a lesser firm, and if I were them I would seize the opportunity to hire her,” he wrote in an e-mail to partners Ray Lane and Ted Schlein. Schlein offered Pao a position on the digital investing team and she decided to stay at Kleiner Perkins. But problems developed there too. Pao had urged Kleiner Perkins to invest in patent firm RPX, which it did. But the board seat, which Ms. Pao wanted, went to Komisar. “Did you tell her that Randy needed a win?” Exelrod asked Doerr. “I told her her job as a junior partner was to support the KP team and Randy and if she couldn’t do that she should do something else,” Doerr said. “Didn’t you say he needed a win?” Exelrod asked. “Randy and Kleiner needed a win. Everybody needs wins. I could use some wins,” said Doerr, with a smile. Doerr said he introduced Pao to his family, met her family, coached her and hired coaches for her, including a speech coach so she could learn to communicate better with other partners and advance her ideas. ".. Because the Indian diaspora has produced such strong ties between Silicon Valley and India, I felt it was important to show that thoughtful academics, with no axes to grind, were concerned by the absence of adequate democratic oversight over a project like "Digital India." I was also in India in August and had a chance to see how the apparent retreat from core values of secularism and free speech make these developments in the digital realm all the more threatening"
"As scholars were approached for support there were some worries that the Government of India might deny research visas or in other ways block the future work of people on the list. This is a legitimate worry considering the record of vindictive actions taken by the Modi government especially against those critical of Modi's record in the state of Gujarat... For those of us who have researched and published on Hindu nationalism for many years, the violent reactions, and the thinly veiled threats are not surprising... The slightly surprising element in the responses is the vehement branding of those of the signatories of Indian background as "traitors" and "saboteurs" of India's development and well-being. This has come with suggestions of stripping these individuals of the citizenship and of course vague threats of other forms of retribution to be exacted by the vast majority who supports Modi. The actual fact is that his parliamentary majority rest on the slimmest proportion of the popular vote ever in the history of independent India (31 percent)"
1. Over the last three decades, a movement toward Hinduizing India--advancing the status of Hindus toward political and social primacy in India-- has continued to gain ground in South Asia and diasporic communities. The Sangh Parivar (the Sangh "family"), the network of groups at the forefront of this Hindu nationalist movement, has an estimated membership numbering in the millions, making the Sangh one of the largest voluntary associations in India. The major organizations in the Sangh include the Rashtriya Swayamsevak Sangh (RSS), Vishwa Hindu Parishad (VHP), Bajrang Dal, and Bharatiya Janata Party (BJP).